You know, back in the day I think I knew something about it, but it's long lost in my aging monkey brain. I do know he replaced it with a 20" that he installed in an observatory on a mountain (what passes for a mountain in upstate NY) by the time I came around. Back then, a 20" was outrageously large for an amateur and knocking on the door of professional territory. It too was on a fork mount IIRC. George Keene helped a good friend of mine (at the time) grind his 8" f/7 and build it. George's son was a friend of my friend Steve. My friend Steve is the one I spent many a night with (overnight) in the observatory at the planetarium, using the 12.5" Cave Observatory Model scope. Sadly, I've long ago lost touch with Steve, as have all my friends from the astronomy club back then. The upside is most of the core of that group is still in touch, one way or another. One of the greatest groups I've been associated with in my life. We not only had star parties on clear weekend nights, but when it was cloudy, we were a close social group too. Niles Root Observatory with Dr Paul's Scope. Edited by rolo, 10 May 2018 - 03:21 PM. I read this topic with great interest. It would seem that the mount is about 50 years old and a thing of beauty. I spend my time both looking through the scope and at it equally. It is such a classic pairing team-up Dr.Paul designed the mount and it is a tribute to his engineering how well and simple it works. It breaks down into three very heavy pieces. It easily holds my 12.5 inch f5 as if it is not even on it. For the solar eclipse a few months ago my neighbor came by to view through it and the first thing he did was to grab the focuser with two hands and hold on to look through the eyepiece at the sun. I was about to warn him that he would jostle the sun out of the eyepiece view and then I realized the scope did not budge. It tracked beautifully. It is a true pleasure to use and is a gigantic improvement over the 1.5 inch shaft Cave mount that the OTA used to ride on. My OTA weighs 76 pounds. The three counterweights weigh 73 pounds all together. 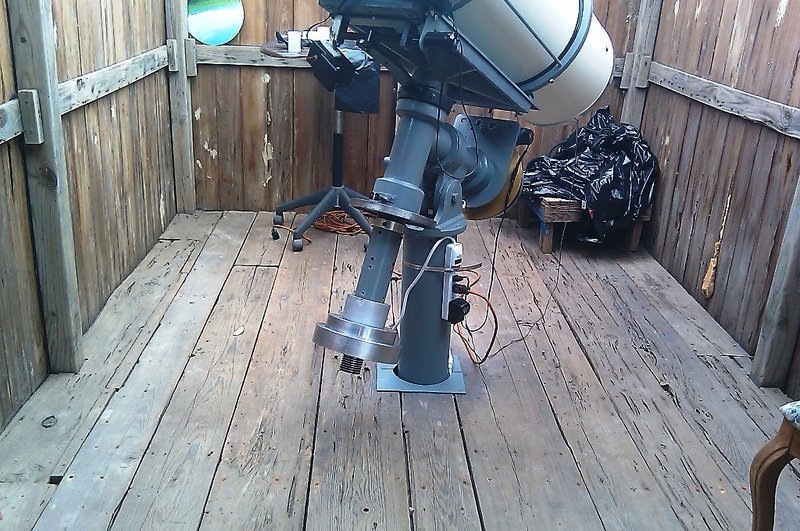 I estimate the weight of the mount and telescope together above the pier is 395 pounds counting the 30 pounds of weight plates I had to add to get it to balance. Edited by L. Regira, 10 May 2018 - 07:42 PM. Glad it worked it worked out for you. The added weigh of the collar must have added twisting force in the Dec axis causing the balance problem. Nice history and back story. Please keep us updated on your progress! Nile Root was a prof in photography while I was a student at RIT. I believe he passed away in 2004. After receiving your suggestion, I did a bit of online searching for George Keene. I learned that he is in his late 80s, and that though he had been living in Oregon, he had likely relocated to another state. The internet provides so much information that it is possible to overstep appropriate social boundaries. Given Mr. Keene’s age I felt a strong need to respect his privacy and was not comfortable trying to contact him directly. 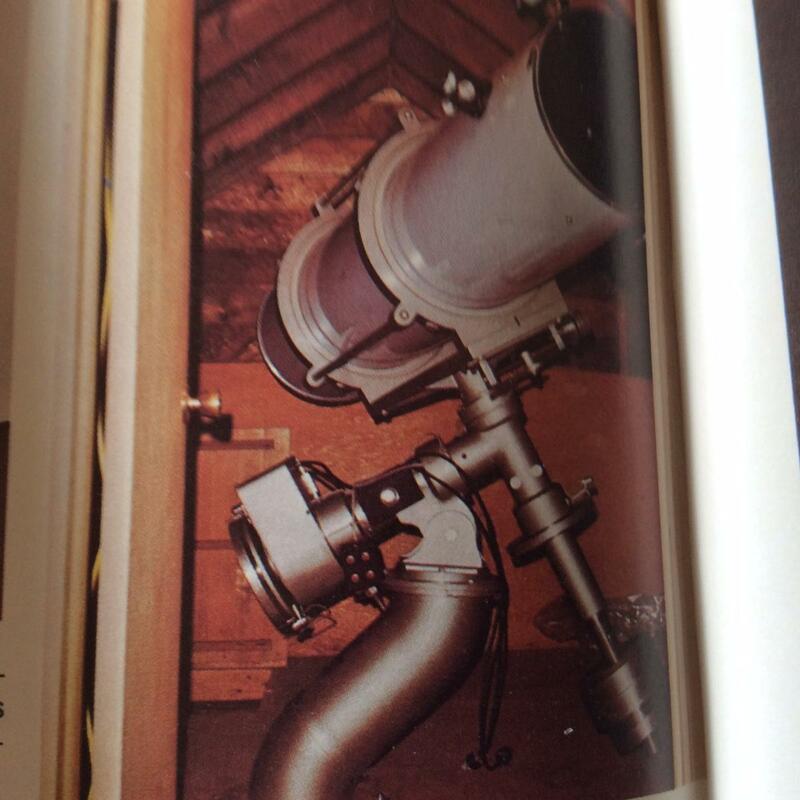 If I hear directly from Mr. Keene I will post more of his recollections of Dr. Paul and the 12 3/4” Scope. Even this small tidbit records the fact that optically savvy people like Dr. Paul and Mr. Keene held Tom Cave and his optics in high regard, so high Dr. Paul chose Cave to create this scope. I also contacted DaveD and he provided information on another person who might shed light on Dr Paul and the scope. Hopefully more to follow! Edited by ltha, 12 May 2018 - 07:39 AM. Other than Terra whom I have met and am quite sure is a mere lass, is anyone contributing to this thread under 50 years old? As I was replacing the batteries in my Orion 1976 yellow (in color) night flashlight I was remarking to my wife that it (unlike me) still works after 42 years. I could contribute by saying I've really enjoyed reading this thread and learning about the history of the scope and people involved! My family used to go to Bend when I was a kid and watch my dad's company softball tournament. I'd always walk around collecting beer cans for money. I bet they have some nice skies there, certainly is pretty country. Edited by PeriodicTrends, 13 May 2018 - 01:49 PM. I do not get the S-curve pier idea at all. You want the c.g. over the pier. That should be somewhere on the RA axis. What is his point? Well, actually you were right, the scope did come north to Bend. The sky here is far darker than the Los Angeles area, though where I lived was blessed with stead skies as I lived next to the ocean. Planetary was excellent, deep sky only a dream. Here deep sky is very good, but stability is not nearly as good. Planetary can be excellent, but those nights are not as numerous as So Cal. But the microbrewery culture makes up for some of that! Dr Paul was very much an astro photographer and specified the “S” curve to allow the scope to track beyond zenith without having to flip the scope over. As far as I can tell, the subsequent owners used a straight pier. 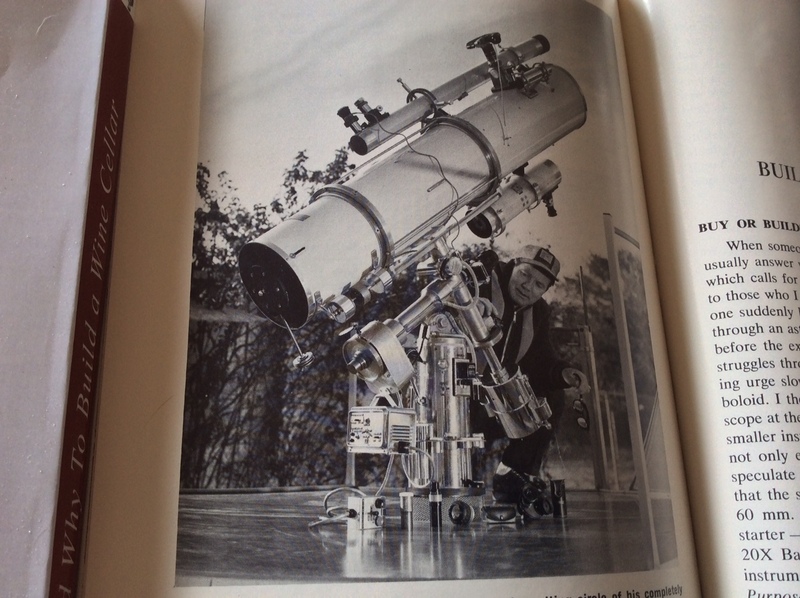 I recently tracked down a copy of “Telescopes For Skygazing, Third Edition” written by Dr Paul. 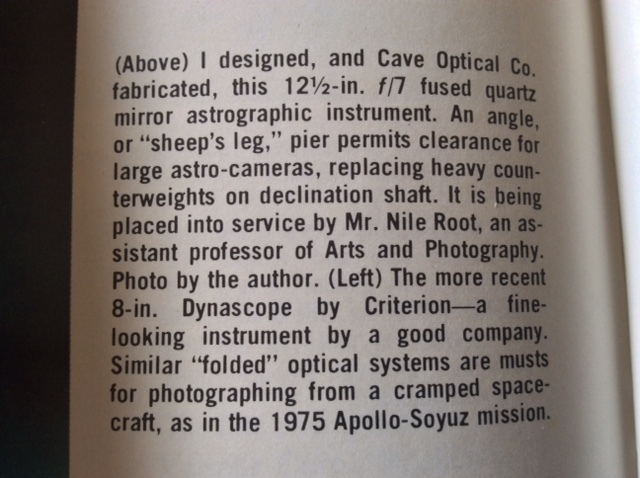 A friend told me that the Cave scope was pictured in it and sure enough it is along with a description. You can clearly see the “S” bend in the pier. Interestingly, the description is mistaken in terms of mirror statistics. It is 12 3/4” and f/6ish. Edited by ltha, 15 May 2018 - 04:06 PM. E Ken Owen! A legend. That's the scope that settled me on 10" as the target aperture. Makes me think of cleaning a old car with all that chrome. Way too much for my taste. I think that one photo of that 10" Cave in a metal boxing ring, going toe to toe with the Universe, influenced me more than any other! 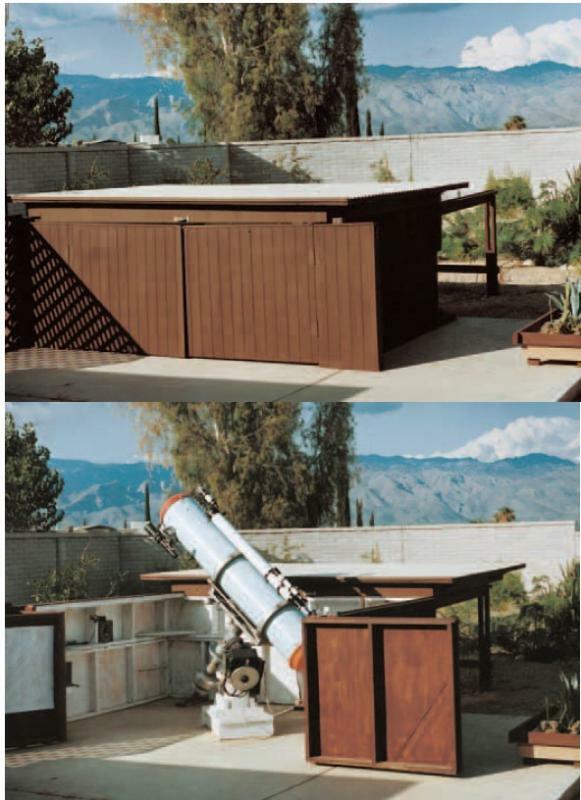 FYI the Ken Owen observatory is featured in the September 1970 issue of S&T. One humorous fact I had forgot is that Owen didn't put a "KEEP OUT" sign on his observatory, he put one that said "HIGH VOLTAGE" which was "far more effective"
Edited by deSitter, 16 May 2018 - 08:45 AM. Oooooooo....... 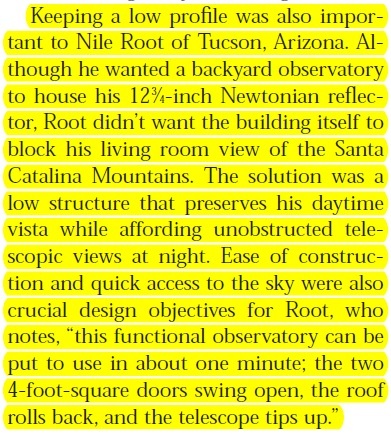 I need to remember this when I build my observatory.